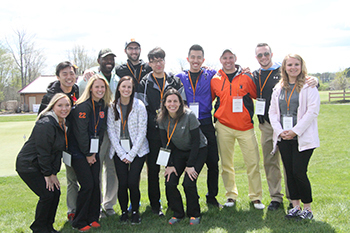 Falk College’s sport venue and event management graduate program hosted a charity golf tournament to benefit Vera House on May 9 at Timber Banks Golf Club in Baldwinsville, N.Y. Recently, the students presented a $15,000 check to Vera House in support of its comprehensive domestic and sexual violence programs. Students exceeded their fundraising goal for the event, which was to raise $5,000—while raising awareness for Vera House. Graduate students from Falk College put together a golf tournament to benefit Vera House’s domestic and sexual violence prevention programs. The tournament included more than 120 golfers, lunch, a dinner reception, silent auction, guest speakers and raffle prizes. The execution of the tournament was part of the sport venue and event management curriculum that requires students to organize an event to gain a direct, hands-on learning experience working in all facets of the sports industry. Student efforts also included selecting the community partner, course operations, marketing, hospitality, fundraising and sponsorships under the leadership of Gina Pauline, associate professor of sport management. The graduate students in the incoming class will now continue the work by organizing the event for the second year, during which they hope to add to the success of the event as well as have different auxiliary events throughout the year to support both their learning as well as the work of Vera House.